Made in Australia, Oceania, 1961-1974. Three paper posters used to promote performances at the The Music Hall Restaurant, Sydney. 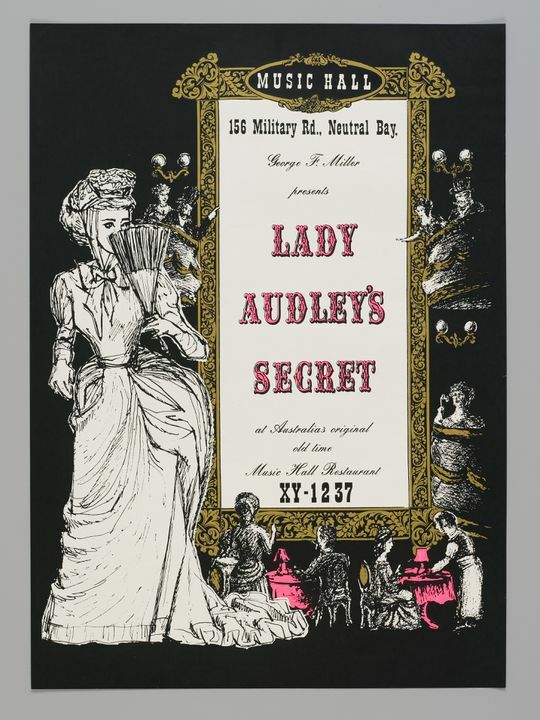 Posters include, 'Lady Audley's Secret', 'The Face at the Window' and 'East Lynne'. The posters were made and used in Australia between 1961-1974. The designer was Brian Edward Walter Smith. The printer is unknown. The posters were used by The Music Hall, Neutral Bay, New South Wales, Australia between 1961-1974.